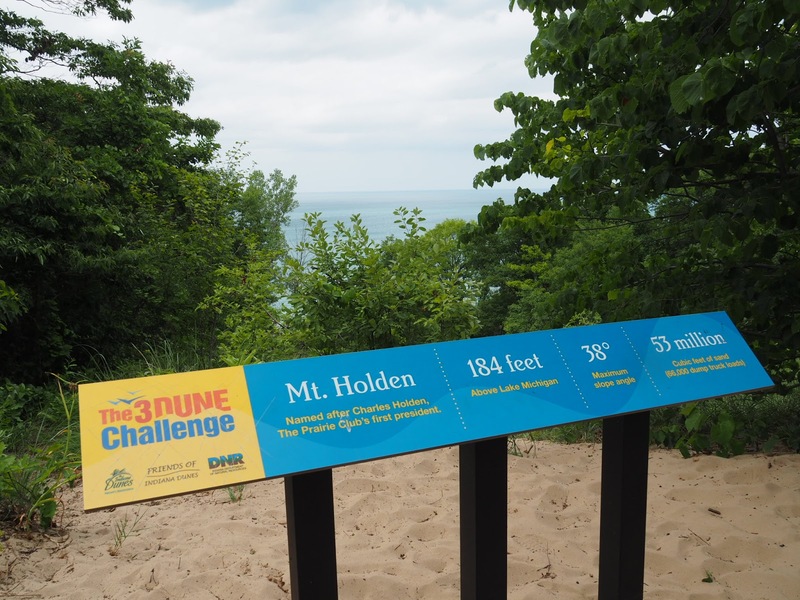 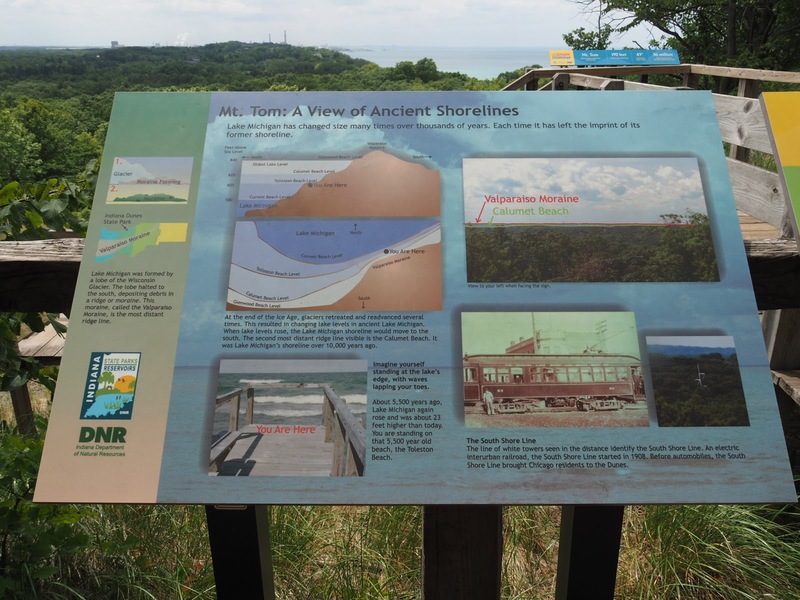 Our first stop on the trip was to complete the 3 Dune Challenge at Indiana Dunes State Park. 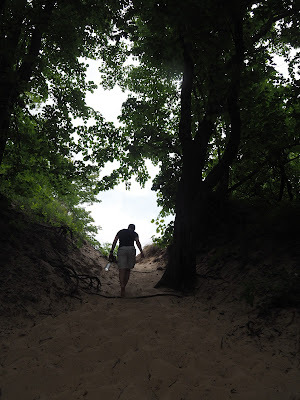 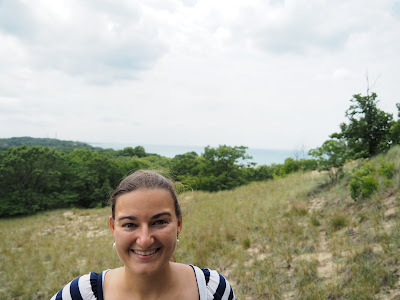 Indiana Dunes (which, depending on where you're standing, is either a state park or a national lakeshore; we were only in the state park portion) is in northern Indiana on the southern shore of Lake Michigan. 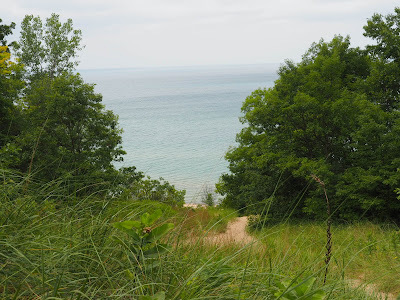 The closest town to the state park is Chesterton (we stopped for lunch at the Port Drive-In) and took us about 3 and a half hours to get to from Bloomington. 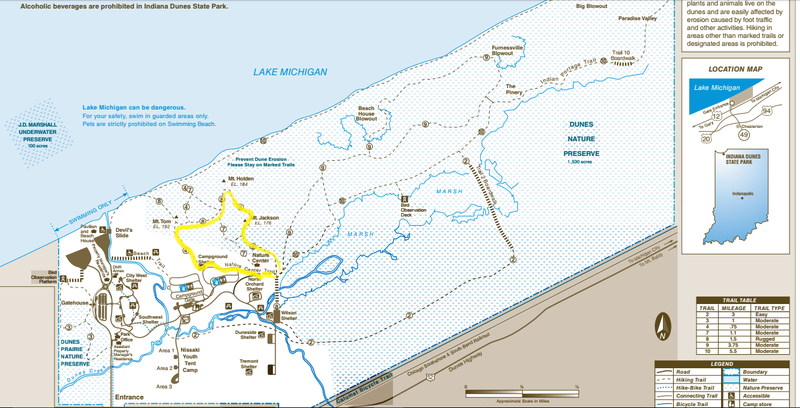 It is also a short drive (about an hour to an hour and a half) or take the train right into the park from Chicago. 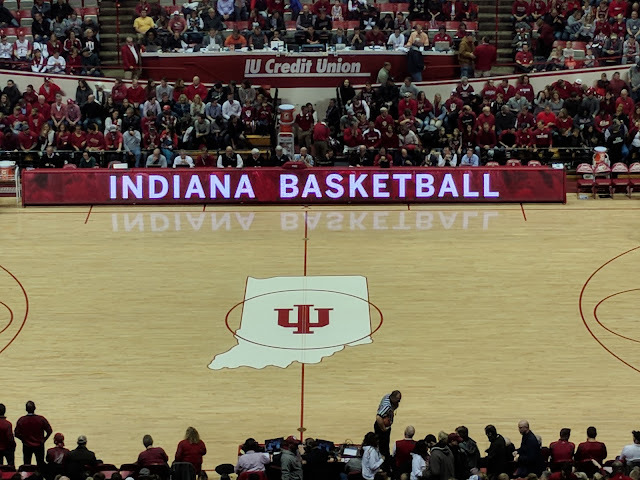 It is $7 for a car with an Indiana license plate to enter or $12 for an out-of-state car. 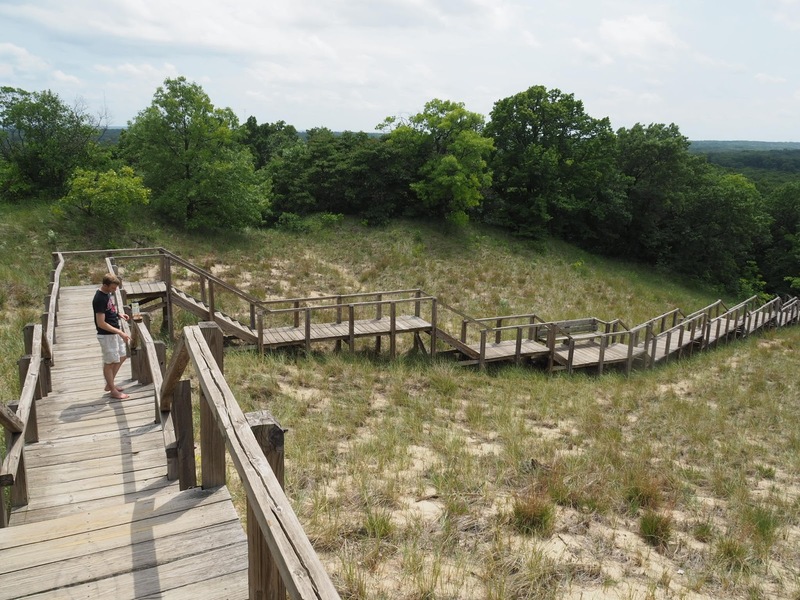 (Note: most Indiana state parks charge $9 for out-of-state cars.) 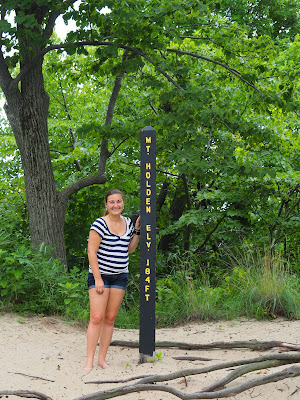 We used our Indiana State Parks pass. 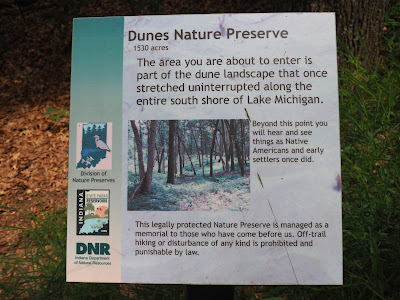 Our main intent at this park was to do the 3 Dune Challenge. 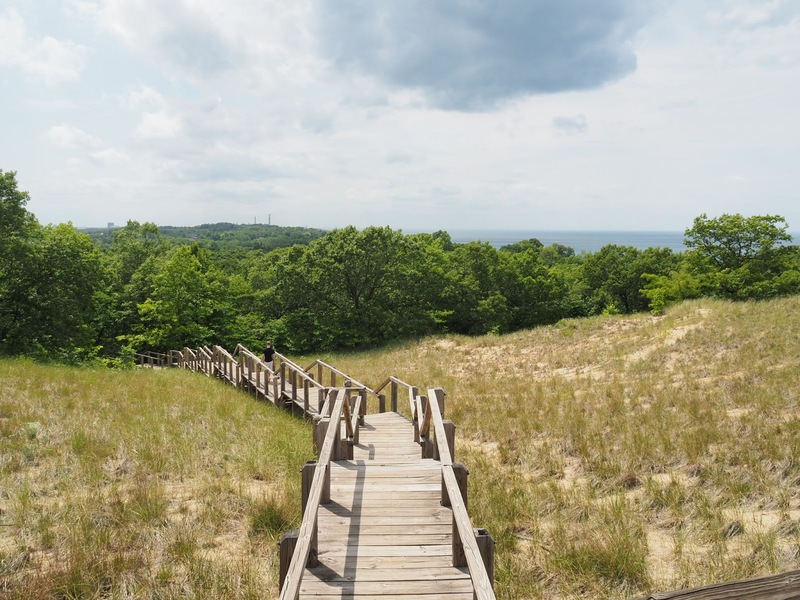 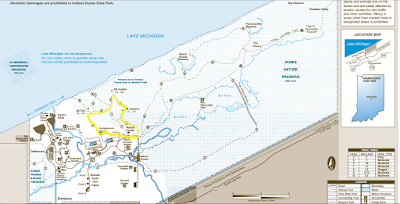 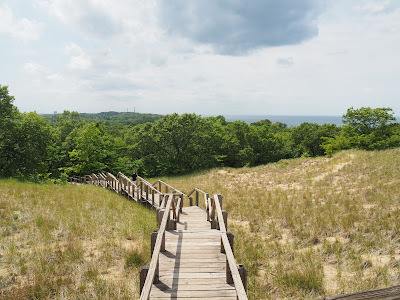 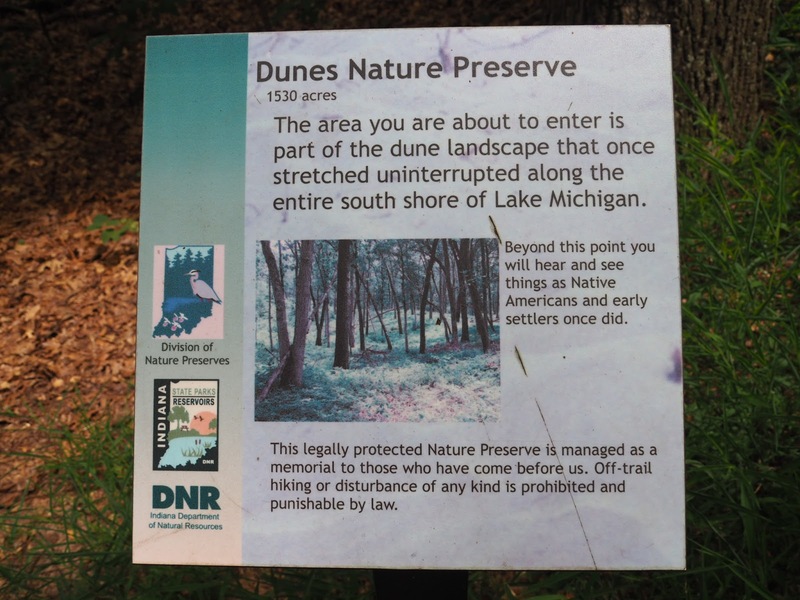 The 1.5 mile loop (Trail 8 to Trail 4) takes you up the three tallest dunes in the state park (note that Mt Baldy, the tallest dune in the area, is on the national lakeshore property and is currently closed and has been since 2013). 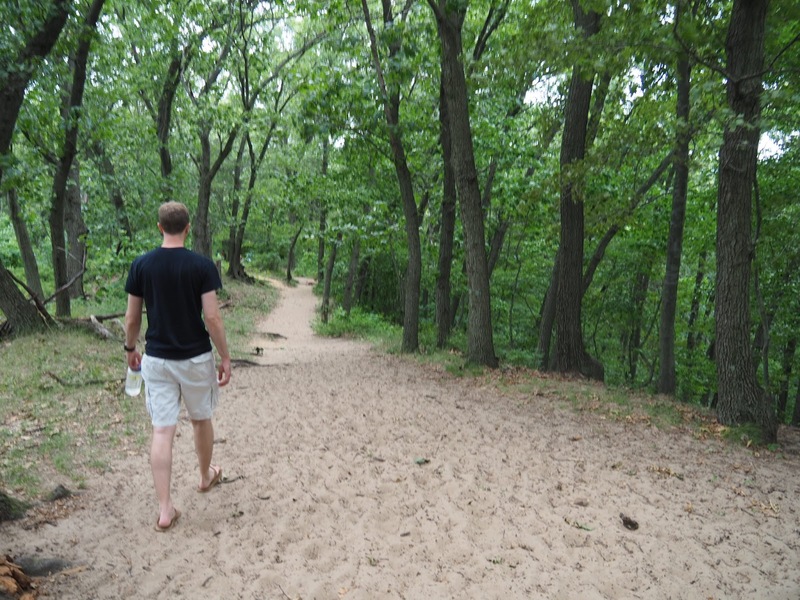 We were not sure of what to expect or what footwear to put on. 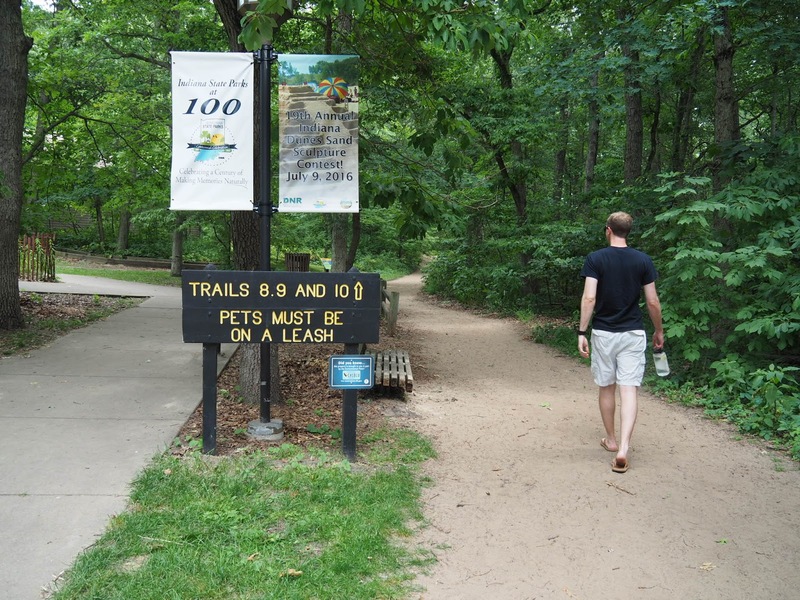 The sign just said, "Wear appropriate footwear" without any explanation. We figured sand meant flip flops or barefoot. The entire trail was sand, even through the woods (it didn't seem that it should be...nothing else had sand on it), but we would have been better suited to wear hiking sandals because there are lots of sticks and roots to navigate (Eric's foot got stabbed by a stick even though he was being careful). 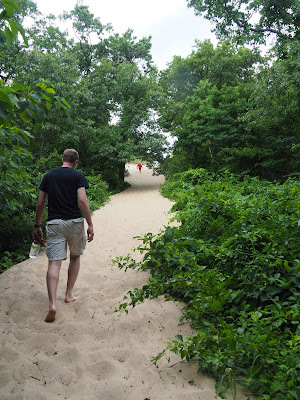 We wore our hiking boots on the other trail we did here and it worked better, but my shoes are still sandy two weeks later. The trailhead is at the parking lot next to the nature center. Right away on the trail you will come to a mostly unmarked intersection. 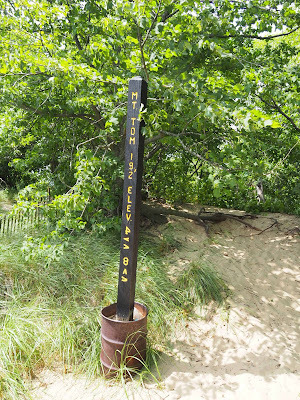 Turn left for the 3 Dune Challenge (the only direction marked). Stay straight for trail 9. 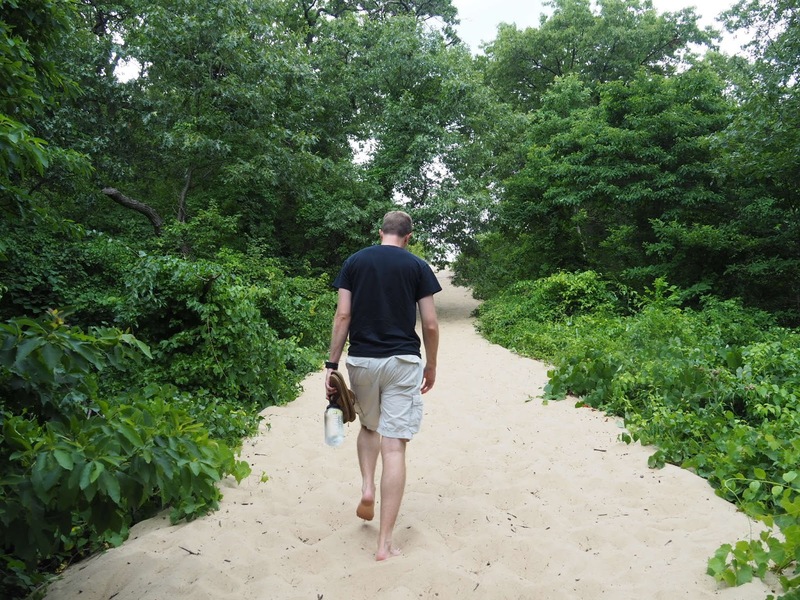 We aren't sure where going right will lead you, since we didn't do it. 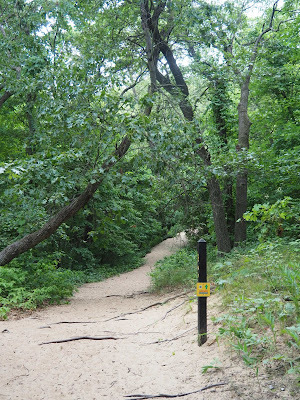 The challenge starts right away; it's hard to tell but the trail in the photo is already going up at a decent angle. Eventually you'll make it to the top. 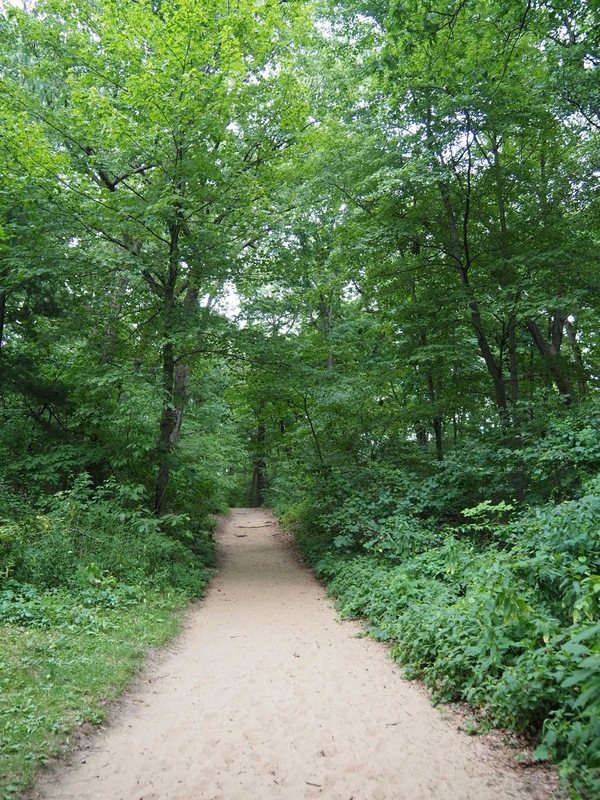 The first summit is half a mile into the trail. 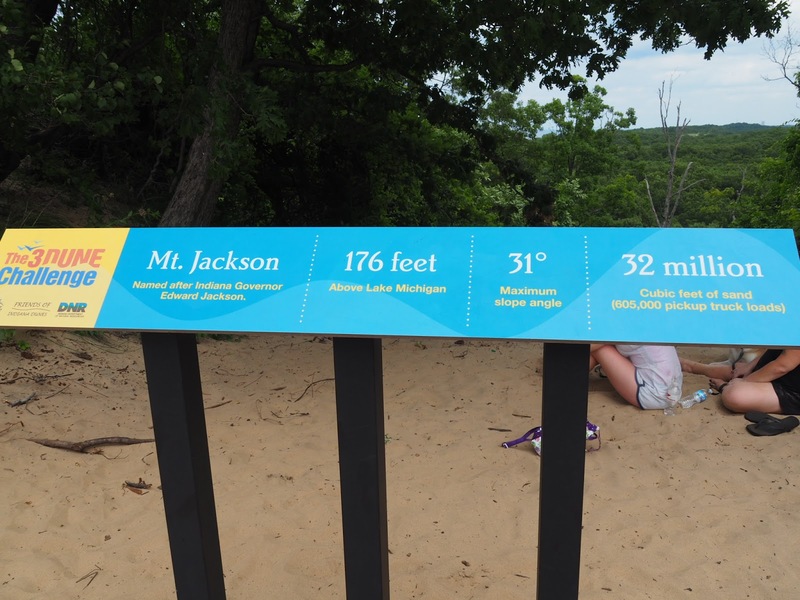 Mt Jackson is 176 ft above Lake Michigan. 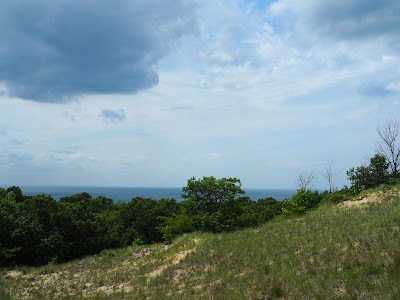 The view from this summit isn't nearly as nice as the views from the next two, so keep going, as tempting as it is to run back down the dune the way you came up. 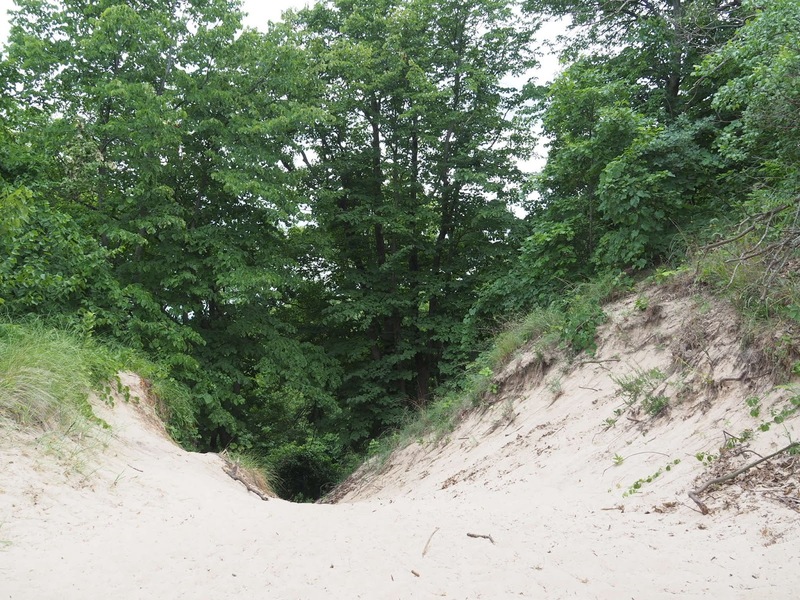 You'll get to go downhill again right away toward the next dune. 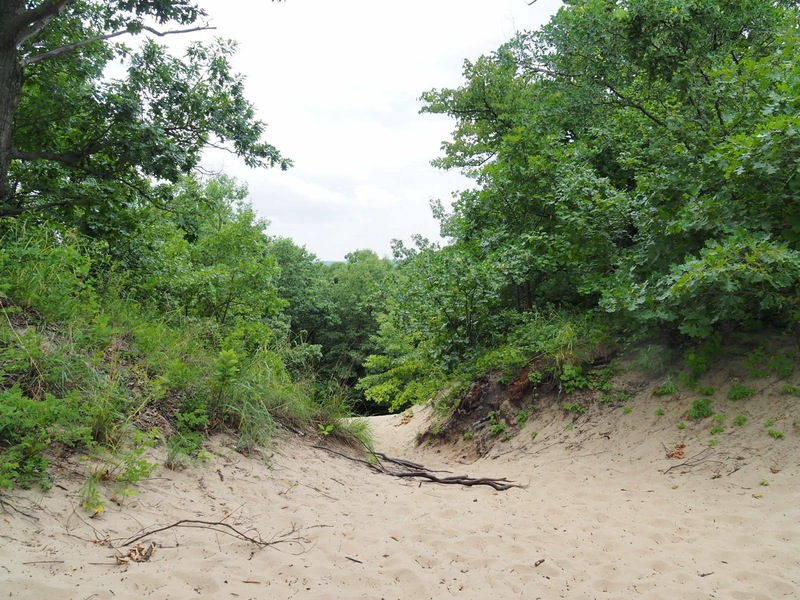 There are lots of roots in this area. 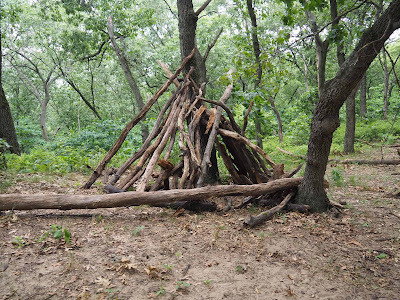 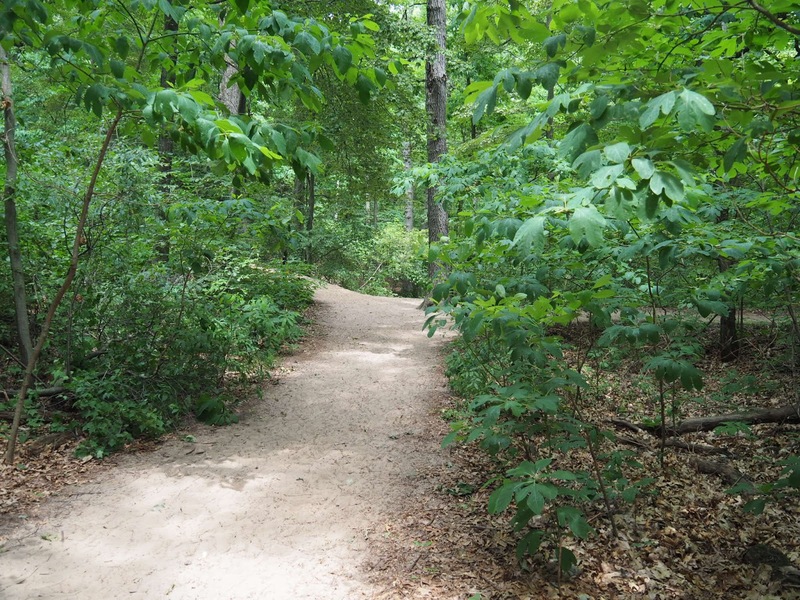 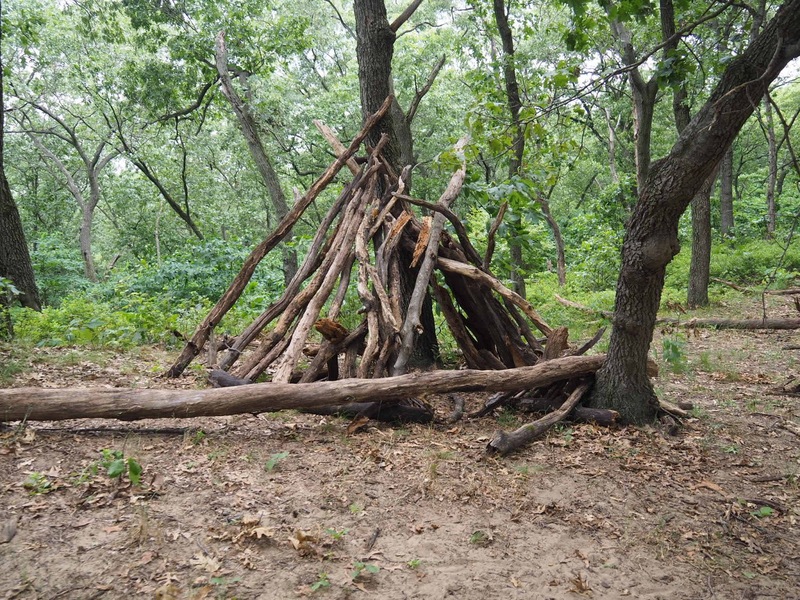 You will have an opportunity to get off Trail 8 and take Trail 7 back to the nature center if you don't want to keep doing the challenge. 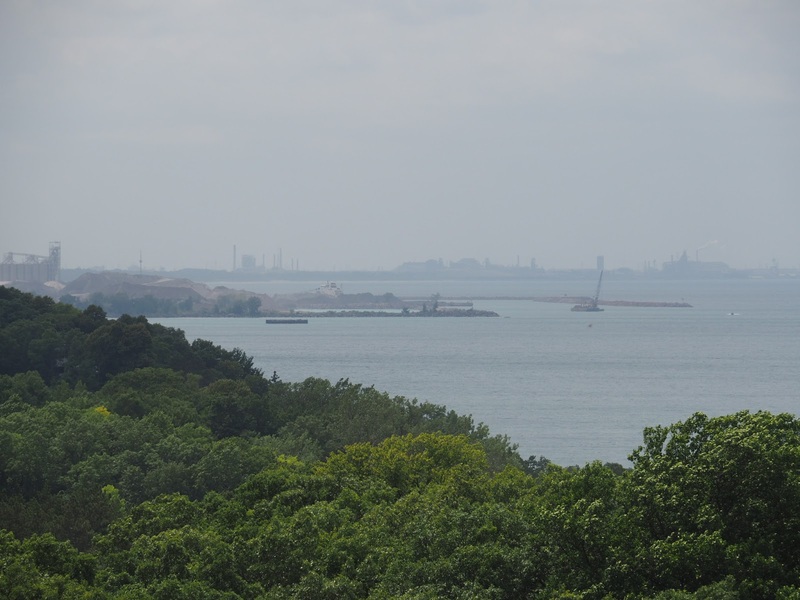 The view from Mt Holden, 184 ft above Lake Michigan, is a little better. This summit is only .2 or so miles from Mt Jackson. 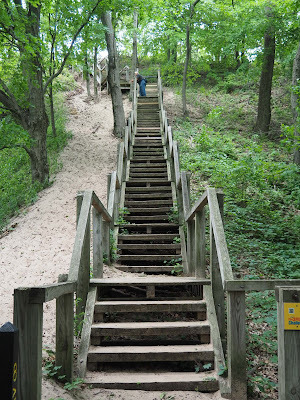 And finally, to summit the last dune, you'll get to take a lot of stairs. 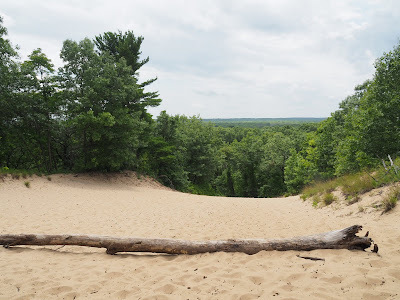 This is again not far from Mt Holden, less than .3 miles up the trail. 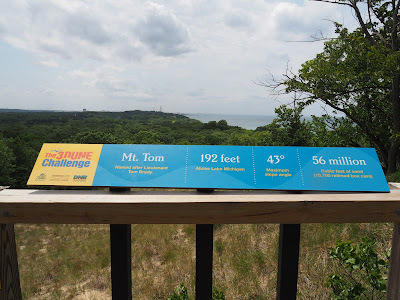 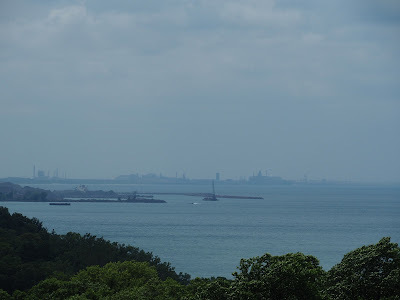 Mt Tom, 192 ft above Lake Michigan, has the widest view. On clear days you can see the Chicago skyline. At the top of Mt Tom you should be about a mile into your hike. (We use a Fitbit Surge, the one with GPS, to keep track of our mileage while hiking.) 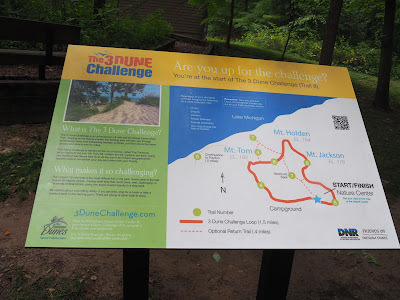 Head down the stairs and follow the signs for the 3 Dune Challenge. You will wind up heading back on Trail 4. You will go through the campground (where there are not any good markers) while you travel toward the nature center and parking lot. It should be about half a mile. 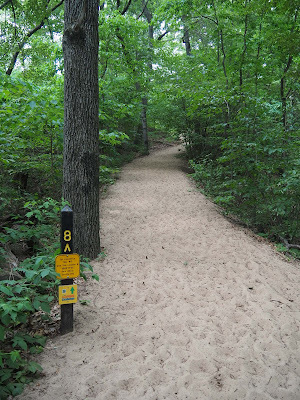 Alternatively, instead of turning left for Trail 4 you can follow Trail 8 all the way down to the beach. 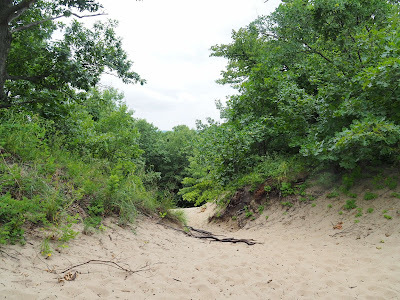 We didn't go to the beach (it actually wound up getting closed when we would have headed there due to the weather) so I can't tell you anything about that, but it's supposed to be nice. If you complete the challenge, you can pick up a sticker or a shirt at the visitor's center (which is not the nature center, frustratingly) about a mile south of the park. 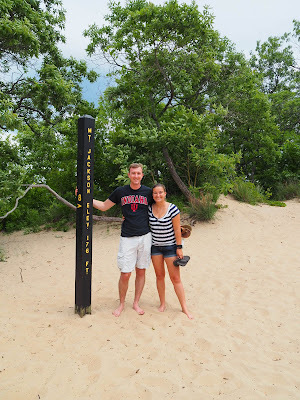 We didn't do this because it was rather out of the way for us. 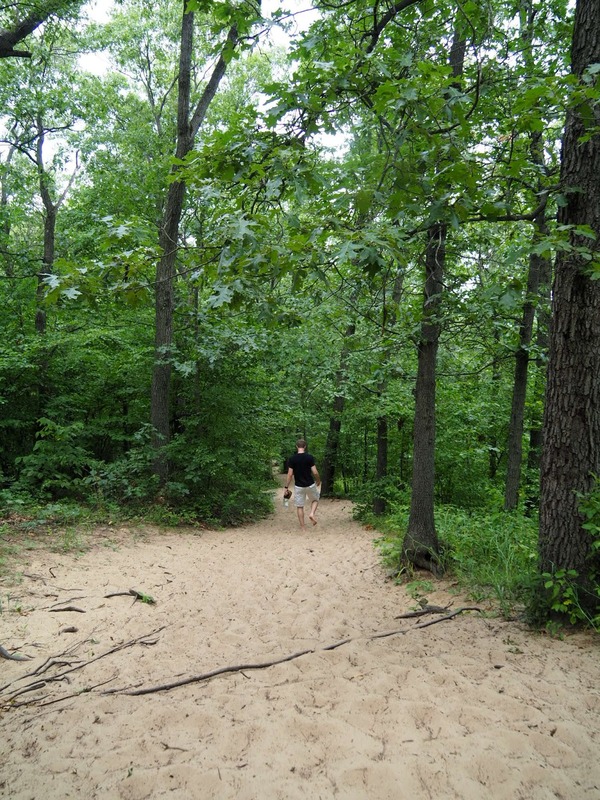 The hike was a good workout; it took us a little less than an hour and my Fitbit says I did 360 ft of elevation gain. 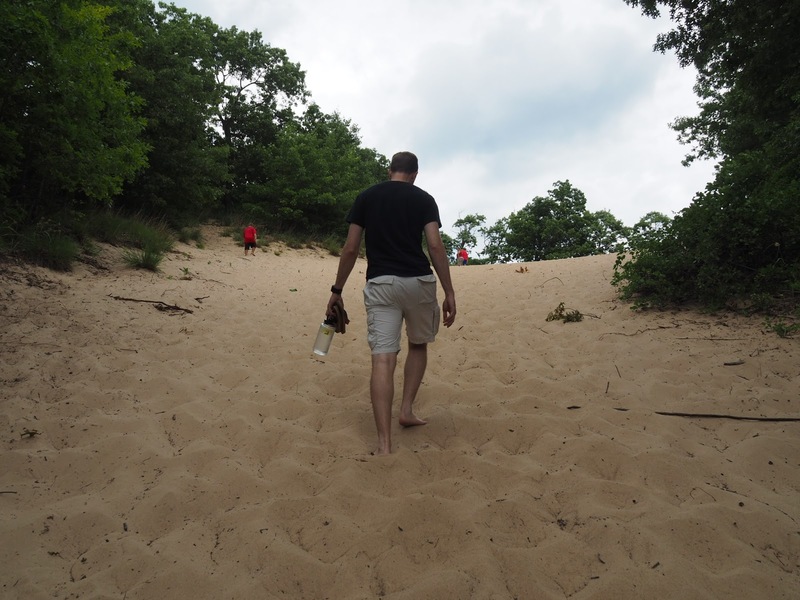 Although I think the views are better from elsewhere in the park, this was a fun way to see the dunes. If you have time and are in good health, it is worth a stop. How to increase your stamina and muscles growth? find out here now.